You can add test records such as Unit, Integration, System, Acceptance, Inspection and Scenario tests directly to an element displayed on a diagram. The element name is highlighted in a lighter shade (the default is white), to indicate that it has been selected. The 'Insert Feature' dialog displays. Click on the appropriate radio button option to associate the required testing feature with the element. 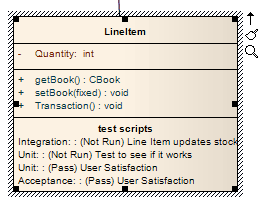 The Testing window opens, showing the appropriate panel for the type of test selected. Complete the fields to define the test activity, and then click on the Save icon in the window toolbar. The test is added to the element. To create a subsequent test activity of this type, click on the 'New' icon. To add items for other types of test, click on the appropriate tab.